Sexual offenders – arguably the most hated and feared of all offenders – commit their crimes in our communities and are then hidden from public view as they serve long prison sentences. However, despite the public’s understandable anxiety, our criminal justice systems hold to the premise that almost all offenders have the right to hope for rehabilitation, even redemption. Therefore the majority of sexual offenders return to live in our communities, closely monitored by criminal justice agencies and subject to rigorous controls. This book provides an authoritative guide to working with sexual offenders, with a focus on managing those who are reintegrating into the community. It includes those with the most striking histories of trauma and psychological difficulty, and those who have previously failed in their attempts at resettlement. It covers helpful theoretical ideas, such as attachment theory and models of desistance, as well as the latest evidence base for good quality risk assessment. The book supports practitioners on the front line of this work by providing them with evidence-based guidance. It presents a multitude of case examples and practice tips that can support effective decision making and achieve safe outcomes, as well as help such offenders build worthwhile community lives. 1. Setting The Scene 2. Risk Toolkit 3. Personality Disorder (Or Pervasive and Persistent Psychological Difficulties) 4. Perversion: The Sexualisation of Aggression 5. What Might a Good Treatment Intervention Look Like? 6. Desistance and the Art of Giving Up Offending Behaviour 7. Where Are We Now? 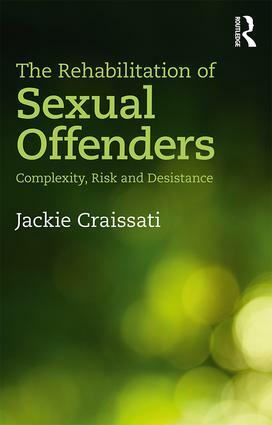 Dr. Jackie Craissati MBE is a Consultant Clinical and Forensic Psychologist and has worked as a leader in the field of offending, risk and mental disorder for over 25 years.